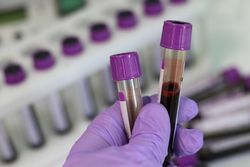 In a study published April 8, 2019 in the Proceedings of the National Academy of Sciences, a group of University of Wisconsin-Madison scientists has identified four blood-based fingerprints - human protein markers - associated with the pre-cancerous forms of colon cancer that are most likely to develop into disease. The gold standard for colon cancer screening is optical colonoscopy, where patients must complete a day-long prep to empty their bowels before undergoing an invasive procedure - factors that contribute to low screening compliance. They examined blood samples from 90 optical colonoscopy patients - split into groups of no, low- or high-risk pre-cancerous polyps - and 31 computed tomographic colonography patients who were monitored without polyp removal.